Join Fast Company from 9am to 5pm ET as we watch Twitter go public Thursday. Fast Company senior writer Ellen McGirt will be taking your questions at 1pm E.T. ; University of Notre Dame Finance Professor Tim Loughran will be joining us to answer your questions at 3:30pm ET. Jack Dorsey's Vine from the floor: "just sitting up our $twtr"
Twitter had a pretty decent day today. Its stock went public and shot up to a pretty steady, with the share price hovering in the mid-to-late $40s all day. Twitter opened at $45.10 and closed at $44.90 a share--73% above its I.P.O. price. Who got rich(er) today? The Twitter IPO Player's Club. So what happens next? Two months ago, Fast Company senior writer Ellen McGirt outlined the five things Twitter needed to do before its IPO. Today, as its IPO day comes to a close, that same list serves as a useful reader for what the newly public Twitter will do next, with new shareholders and investors to keep happy. At the top of the list: Revamp Twitter to appeal to "normals," which includes everyone from your grandmother to your postal carrier. But the task of reinventing itself as a fully mainstream service won't necessarily be easy for Twitter, as Christina Chaey explains here. Twitter also has its sights set firmly on TV. But can those efforts really lead to a more profitable future for the microblogging service, which despite a high user base has yet to make any profit at all? Ellen McGirt and Nicole LaPorte took a deep look for our November cover story. Thanks for joining our live coverage today, everyone! Thanks for joining our live coverage! We'll be kicking this blog off at 9am. While she didn't name Twitter specifically, it's perhaps no coincidence that the the Chair of the Securities and Exchange Commission, Mary Jo White, said in a speech yesterday that the SEC is concerned that investors may be misled by the “unique financial or operational metrics” tech companies use to tout their success, such as high user numbers. The SEC is concerned that investors may think that these high numbers correlate with high profitability. Twitter, of course, has yet to make a profit, despite having 232 million users--and that number is growing. “What if only a fraction of those users are paying customers? What does that mean for future financial results? What if the bulk of the growth in the number of users is in an area where the company has not yet figured out how to turn those users into paying customers? What does that then say about the meaning of user growth rates? White posed. Twitter doesn't charge its users, and its hard to imagine a future in which it would ever consider such a risky move. White poses some serious questions. But the company is not without a plan. Read about Twitter's vision for a -powered, profitable future here. Twitter picked a 9-year-old girl with a lemonade stand whose proceeds are used to fight slavery to ring the bell for them. She was joined by Star Trek actor Patrick Stewart and a Boston police officer. The moment Twitter went public. Ringing the bell was the easy part. Twitter can look forward to a lot volatility and noise around its stock in the months to come. Still waiting for the first Twitter trade. 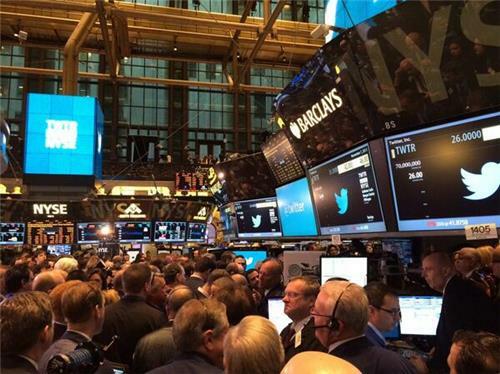 "Traders on the floor are guessing Twitter will open at $46," reports the New York Times' David Gelles. 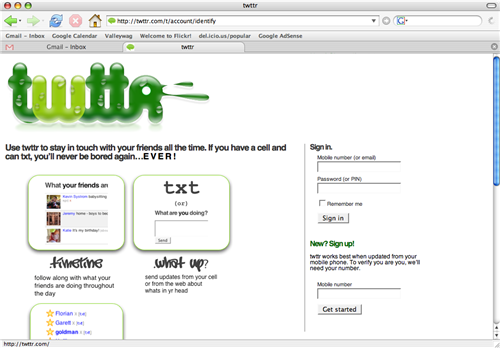 Here's what Twitter looked like in 2006 -- kudos to Jason Kottke for this early screenshot. "The freedom to share without placing the recipient under any obligation to read, respond or reciprocate." - The Drum asked top tweeters from the world of media and marketing what Twitter means to them. The above is @rorysutherland's answer. What's yours? Twitter is finally trading -- at $47.12 a share. 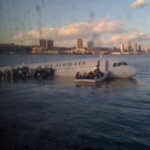 Remember the Miracle On The Hudson? 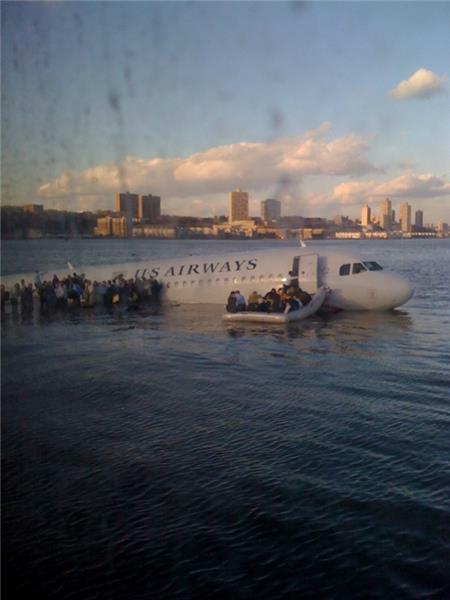 Christina Chaey rounded up 14 of the most important moments in Twitter's history here. Twitter is already up 80% -- fireworks! And by that I mean: Best to sit back and watch, but not get in on the action unless you don't mind getting burned. This is now the most over-valued stock on the market. Look back at Facebook, LinkedIn, and Baidu: they all dropped back under their IPO price for a period of time before regaining ground. Groupon and Zynga fell and never recovered. The purpose of raising money on the market is to fund new initiatives, which is great. But those take time to come to fruition and become profitable. How long? Depends on how ambitious those plans are. Another factor to consider is that the supply of shares on the open market will increase over the next year or two as people who hold stock get out of the lockup period, or employees see their shares vest. This can change the market in unpredictable ways. What are the big challenges facing Twitter as it goes to market? * User growth is slowing. * The company is already generating large losses. Noah, I'd add improving the user experience to make it more accessible to new users (and improve retention rates of new users -- getting them to send that second tweet!) without upsetting existing users. Another challenge facing Twitter -- and this is a big one on IPO day -- about 75% of Twitter's users live overseas, but only about 25% of its revenue comes from non-U.S. advertisers. Now let's look at a couple that started steady, and went the other direction. There have been 120 IPOs in 2013. An interesting tally from Jay R. Ritter at the University of Florida. In 1996 there were a whopping 676 IPOs. He also calculates the mean return on the first day of trading in a report last updated Oct 23.
h/t to Alexis Madrigal for the link to this report. 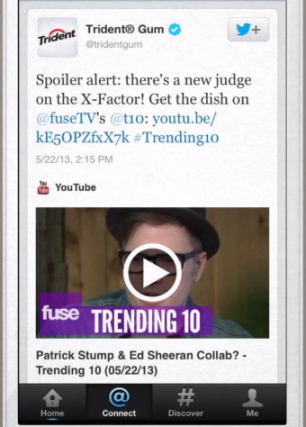 How exactly does Twitter think it's going to make money from TV? I don't see where the revenue options are? There are a bunch of examples. I think a show like American Idol has been really forward thinking in the way it works with Twitter. (And even though I know the show's ratings have been sinking, they've arguably sunk less due to Twitter engagement). But they've done things like have Ryan Seacrest ask a question that viewers answered on Twitter with a specific hashtag. (That was done in partnership with AT&T so there's a marketing oppty playing into it as well). Idol also does something where after a contestant is eliminated they keep Tweeting out photos of that contestant and sort of keeping their story alive on Twitter, which is really popular with viewers. "The Voice" also has a really active Twitter engagement going on. Obviously, reality shows tend to work best with Twitter because people are generally watching them live and wanting to be a part of the conversation in real time. This was the first television commercial to include a hashtag, at least on a national scale. 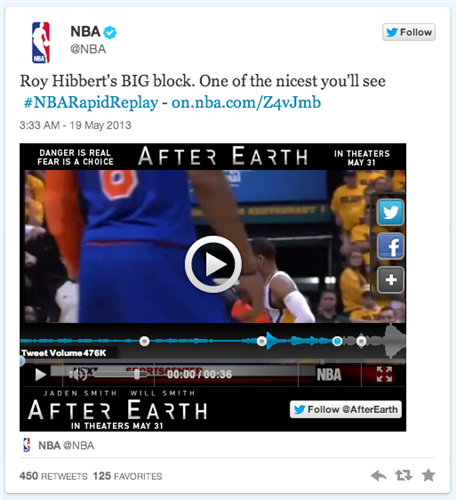 Here's an example of an in-stream Twitter TV ad. It might interest all of you that Nielsen now releases Twitter TV ratings -- you can check them out here. I think we'll see things evolve a lot in the Twitter ad space. I mean, why shouldn't Twitter partner with a brand and release a short movie? I think a scenario in which Twitter almost becomes something of a distributor of content will be something we'll be seeing at some point. I think there's a creative partnership that exists between Twitter and Hollywood because of its close TV relationship, that Facebook doesn't share. I think that has to play out in the ad arena. Another example of an in-stream TV ad. Following-up on Nicole's answer, Twitter is crafting its technology in a way that makes it easier to share media. They recently changed things so that uploaded images show at full size when you include them in a tweet. You can also embed video or sound files. So it's not far-fetched to think that people will start debuting content in the stream, and that Twitter can help make sure it gets seen. And here's a recent story we published about how Twitter is competing with Facebook in the social advertising space. Jumping on with Noah and Nicole - it's going to be fun to see who else takes to this change. Sports fans tend to love more, and more exclusive, stuff. But I'm guessing that we'll see more from live events that aren't televised as well. And journalism! With Vivian Schiller, formerly of NPR and NBC digital on the case, we should see something interesting from that camp as well. Twitter is creating a a lot of wealth today. And no doubt the immediate focus will be on generating revenue, and turning a profit, in the near future. But Twitter has also been a force for change around the world. So I'd like to wrap up by asking about what Twitter, and the newly-minted millionaires it created, could do with some of that money to be a force for good. From a company perspective, they’ve got cash and a deep bench of talent. What now? There are real (but not easily monetizable) opportunities to be found on a platform as accessible, global and public as Twitter. And those opportunities can have profound impacts on the world. One of the most inspiring conversations I had with Deb Roy, the co-founder of BlueFin and MIT professor, was about just that. What else could Twitter be besides a conduit for Duck Dynasty mockery? For me, that means breakthroughs in deeply important areas - brainstorming here - like tracking infectious diseases, enforcing civil rights and finding better ways to be, well, better people. What could we learn about, say, Haiti if everyone there used Twitter? How could we impact the scourge of human trafficking? I know, I know. Idealism. But the Valley loves to hit us with big talk about changing the world. It seems to me that the gift of simple, democratic transparency that has always been at the heart of Twitter could actually live up to the promise. And kittens. More kittens, please.